Welcome to our Online Store – Daniel Sysoev Inc.
Front page > Welcome to our Online Store – Daniel Sysoev Inc. Here you can purchase Orthodox literature and CD in low prices and in English and Russian languages. Our warehouse has pretty large range of orthodox books (1200 different), church supplies (800 kinds), orthodox jewelry such as crosses, icons, rings and chaings in silver, gold, silver with gold and gold plate(1800 kinds). If you are a wholesale buyer, a bookstore or church store, we provide 40% OFF and you can email us and request the full catalogue and spread sheet with the prices and description. All our range of goods we are going to place in our online store soon. Daniel Sysoev Inc. (also referred to as “the Company”) will be a United States based subsidiary of Moscow, Russia, based Christian Orthodox wholesale distributor, Rev. Daniel Sysoev Missionary Center Benevolent Fund (also referred to as “the Foreign Company”.) The Foreign Company sells Orthodox literature, media, church supplies, and items. Rev. 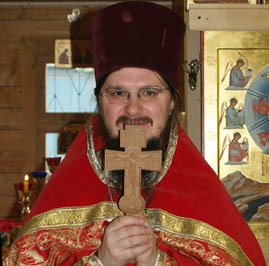 Daniel Sysoev Missionary Center Benevolent Fund’s primary activities center around the martyrdom of the Orthodox priest, Daniel Sysoev (also known as “Father Daniel“). The Foreign Company continues to spread Father Daniel’s message of enlightenment through its mission statement, its website and its retail e-commerce store. Daniel Sysoev Inc. has actively participated in spreading Father Daniel’s message and writings, as well as Christian Orthodoxy in general, throughout the world. The Foreign Company has established a U.S. subsidiary in order to better reach the United States and Canadian markets. — Promoting projects to further the mission of Orthodoxy in the world. It is our desire that people on American soil might have spiritual food in abundance in the form of Orthodox literature, and that each person be able to acquire these books as needed. In this day and age life goes by at a frantic pace: people race about, never having enough time, and sudden-ly we ﬁ nd that we have done nothing for eternal life. This rhythm of life is not of God. Father Daniel said that we must hasten to sow more fruits for the Kingdom of Heaven, running to cleanse our heart with tears of repentance and put on the garment of good deeds performed for Christ’s sake. To do this we must learn to stand still amid the whirlpool of earthly vanities, raise our eyes to heaven, think about God and pray to Him. We must make time to read spiritual books for our mind’s ediﬁ cation, for the vanity of this world strives to darken the mind: the devil wishes for man to be left with no time to think of God. One eﬀ ective weapon against the enemy’s vanities is a book – one capable of turning our thoughts and feelings toward our heavenly homeland to which we are called. It is our goal to bring back the laudable tradition of reading Orthodox books. If you share our goals and feel able and inclined to assist in achieving this common goal, write to us at mission379@gmail.com. It may be that our joint efforts will bear much fruit. Daniel Sysoev Inc. and its warehouse is located in Voorhees, New Jersey and is a wholesale distributor of Christian Orthodox literature and other products. We translate Orthodox literature into English, sell it and distribute it, together with Russian language books, CDs, DVDs, church supplies, and religious jewelry to individuals, churches and Christian Orthodox stores throughout the U.S. and Canada. Daniel Sysoev caters to the over one million North American Christian Orthodox believers, who currently do not have easy and affordable access to religious literature and supplies. Daniel Sysoev Inc is dedicated to maintaining and sharing Father Daniel’s writings and beliefs. We are expanding to the United States in order to share Father Daniel’s work with the North American populous and to address a market need for Christian Orthodox literature and merchandise. Father Daniel had a profound understanding on the texts of Holy Scripture as explained by the holy fathers of the Orthodox Church. Father Daniel’s ordained ability to interpret and teach the Bible and its lessons have enlightened and continue to enlighten and grace the hearts and minds of many. Many individuals have changed their path upon reading his work, finding answers to life’s difficult questions and strengthening their desire to inherit eternal life with God. Our Company maintains the mission websites (mission-center.com (in russian language), mission-shop.com , and danielsysoev.com) through which it shares literature and coordinates its community of believers and international missionary work. We currently contact with missionaries spreading the word of Father Daniel in Cambodia, India, the Philippines, Hong Kong, Pakistan, and Thailand. The site of the benevolent fund in Russia matushkideti.ru (in russian language).